So here are the next lot of photos, taken today (red top) the other photo in the green is the one taken at 16 weeks to do a comparison shot. Donna is officially half way and she is looking great. The photos are getting wackier every time we take them LOL. She is really starting to round up now, which is so cool. These shots are the more serious shots (above) now check out some of these, they are cute and cheeky. Sorry Donna, just had to share some of these, I love them!!!!! Donna also had a scan last week, how cute is this pic....(dad had a look at the pic, Donna and he thinks that the baby has your nose LOL). 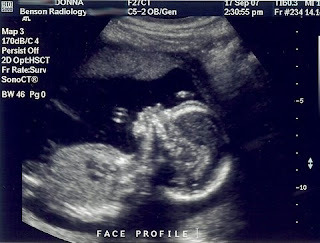 She also had a video done of the ultrasound, and Renee and I think we saw a little boy feature, but we can't be sure. So far so good with the baby, everything seems to be developing normal. Wow your sister is looking great, give her my best. 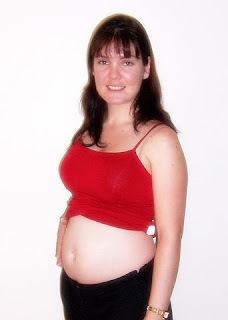 The best thing to do is have fun being pregnant. No worries about the stamp club, the location will change from time to time will keep you posted. What fabby pics of Donna! She looks so happy and who wouldn't be with such a blessing on the way! She's going to absolutely treasure these piccies you're taking Leanne! I totally have belly envy Leanne. 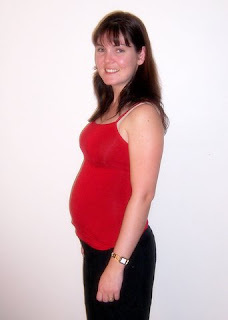 Donna looks great - and is obviously having a great time with this pregnancy. Gosh you are a wonderufl sister. I wish I had someone to remind me to take belly photos. Maybe I should go and do that right now! !